From Broken and Abandonment, to Love and Hope. Today, Our Little Roses Ministries provides the opportunity for a childhood that all girls deserve – protection from harm; a safe, healthy and loving home; a chance to learn; the dream of a future, and a foundation in faith. Many girls who once had little or nothing have graduated not only from elementary school, but from high school, some from university and one from dental school. Evelin Nayeli is sponsored by St. Mark's. She arrived at Our Little Roses the week that Marcia Allison was doing mission work there in January 2017. Evelin is 7 years old. St. Mark's donates her tuition and other educational expenses. 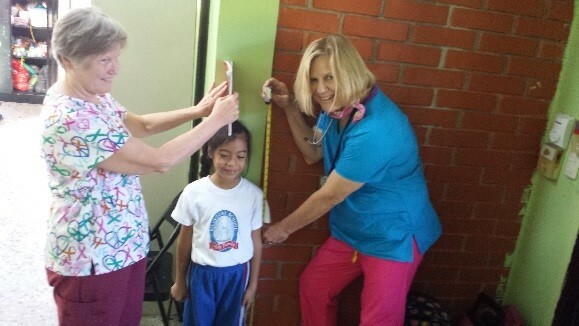 Parishioner Sherre Henley (left) on a mission trip with Our Little Roses in Honduras, providing health assessments.